I’d like to introduce you to Aubrey of PowerOfNatureJewels Healing Jewelry. 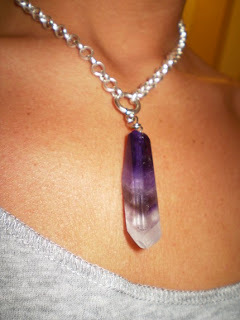 Here you will find all sorts of beautiful pieces made from crystal which are known to have healing properties. I love the healing necklaces and earrings. I am a HUGE crystal fan and her store is right up my ally! I asked Aubrey a few questions to learn about her and her work. I opened my shop in August 2008. I am both the artist and creator of all the jewelry in my shop. Creative by nature I am known to always be working on several projects at a time. All of that came to a screeching halt several months ago when I was seriously injured in a car accident. Which has left me with both immense pain and time on my hands. I found myself drawn to searching for other forms of healing. The healing power of stones and other natural elements immediately sparked my interest. I have created beautiful jewelery with stones and other natural elements hand picked for their special healing properties. Creating these special pieces has brought me comfort and pride in something I can create and be around the natural healing properties of, and present them to the world. My wish is that each item I sell is worn in much good health, good fortune, Love and Light! Each item I sell comes with and explanation of what healing gemstones and powers are incorporated into each piece.Getting to create these pieces for people and hearing their wonderful feedback and kind words, keeps me going. I love my customers! They are so awesome and caring, and keep my spirits up! I’ve established many friendships through kindred spirits who find me and my shop. Getting to work one on one with customers that wish for custom pieces is also a treasured joy for me. What is your favourite crystal? Such a hard question! I really cannot say there is any one that I can call a favorite, for each one is so very special in it’s own way and has it’s own vibrations and energy. So my favorite is really all of them!! I truly cannot pick! Even as a little girl I was scouring the ground for “pretty stones”, and putting them in my pockets, (Mom loved that when it came laundry day) lol and I still find myself today as an adult still walking around with stones in my pockets! 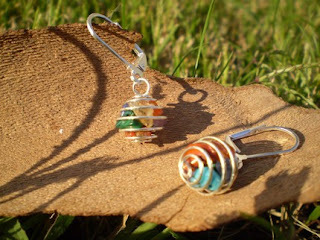 Aubrey has generously offered one of my readers the 7 Chakra Earrings! The crystals in these earrings are Red Jasper, Carnelian, Citrine, Malachite, Sodalite, Turquoise, and Amethyst. 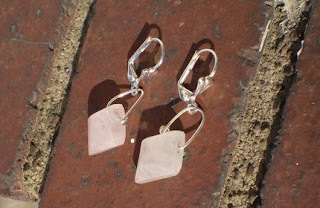 I absolutely adore these earrings and think they are really great find!